In a highly contested NL West, the Padres will look to beat out rivals the Los Angeles Dodgers and the San Francisco Giants. On the hunt for a World Series ring, the up and coming Padres will look to gain the division crown and sit atop of the southern California baseball hierarchy over Los Angeles Dodgers and the Los Angeles Angels of Anaheim. Grab your 2018 San Diego Padres tickets and head down to Petco Park to be a part of your team’s home field advantage. Though the Padres failed to make it into the playoffs in 2017, the upcoming season could be a whole new ballgame. With the arrival of MLB 2018 season, the Padres have dedicated themselves to a complete rebuild of the roster with youngsters full of exceptional talent. A relatively young side, the San Diego Padres joined the MLB as an expansion team in 1969. Representing the West Division, the team hasn’t enjoyed a lot of success, but they did manage to win two NL pennants (1984 and 1998) and five Division titles (1984, 1996, 1998, 2005 and 2006). Nonetheless, the Padres have treated their diehard fans to some exciting games and established themselves as a relevant MLB team. 1984 Padres Win the Pennant – With only 15 seasons in, the San Diego Padres were considered new kids on the block. Their start to the season wasn’t exactly promising as they lost the first two NLCS games and returned to San Diego dejected. Their fans however had other plans. In the Padres next home game at the Jack Murphy Stadium, a capacity crowd came out to support the side. It was just the emotional uplift the team needed and they won their next two games, setting up a game 5 decide, which they won as well. It was the Padres first-ever NL pennant and they advanced to the World Series. They were eventually defeated by the Detroit Tigers, 4-1. The 1998 Season – Throughout their history, only four Padres teams have managed to win more than 90 games and the team in 1998 was one of them. Winning 98 regular season games en route to an appearance in the World Series, the Padres’ roster boasted Trevor Hoffman and Tony Gwynn. The lineup also included Kevin Brown, a top three Cy Young finisher, and Greg Vaughn, the 50-homer MVP. Ken Caminiti and others like Andy Ashby, Wally Joyner and Steve Finley were also part of the Padres 1998 roster. In the World Series Finals, they met the in-form New York Yankees, who won the title, 4-0. Nonetheless, for the Padres, the season is full of fond memories as they won their third West Division title and recorded an 11-game winning streak. Baseball fans love good old fashioned rivalries. They not only bring out the best in the players on-field, but also thrill the fans in the stands. Padres-Dodgers Rivalry – Nothing fierce, but theirs is a rivalry that pushes each side to play their best. Between the San Francisco Giants and the LA Dodgers, the Padres weren’t given much chance to win a championship or shine in their division. This often irked the young players and whenever the two teams meet, the fans get to watch a head-to-head faceoff. Padres-Seattle Mariners Rivalry – The San Diego Padres defeated the then Seattle Indians in their first home game in team’s history and since then things haven’t been the same. From 1997 till 2016, they also played the interleague series called the Vedder Cup that further ignited the rivalry. Despite their lack of title-winning history, the San Diego Padres have produced extraordinary players. Tony Gwynn remained as the steadiest hitter for the Padres for almost 20 years and was later inducted into the Baseball Hall of Fame. He won 8 NL batting titles and was a 15-time All Star. Dave Winfield also remained a vital name in the Padres side, shining as their All-Star player. Trevor Hoffman is another name that the San Diego Padres are proud of. Petco Park, the home ground for the San Diego Padres, is a great place for fans to enjoy craft beer and good food. This 41,000 open-air ballpark is located in downtown San Diego. Petco Park gives fans an opportunity to enjoy an open-air ballpark in downtown San Diego, California. Besides being conveniently located right by the beach, fans can enjoy the “Park at the Park”, a grassy berm sloping above the outfield fence, which is open during game time. While the Padres haven’t been to the playoffs since 2007, the current roster of young players are looking forward to prove themselves. A productive season is being predicted nevertheless from the likes of Carlos Asuaje, Manuel Margot, Hunter Renfroe and Austin Hedges. Keep an eye out for Padre Game Tickets and come support the side as they take on their rivals this year. Our process for purchasing cheap San Diego Padres tickets is simple and fast. There are so many online ticketing sites, that it can be hard for customers to find the right place to buy San Diego Padres tickets at the cheapest price. At ScoreBig we think of our customers first and foremost. We offer daily deals for San Diego Padres events, so our customers can get the best seats for the best prices. ScoreBig will always go above and beyond to offer the cheapest San Diego Padres tickets on the market. The San Diego Padres schedule above, displays all available events for 2019 and 2020. Once you find the event that you would like to go to, click the red “Get Tickets” button. It is located on the right-hand side of the event listing, it will take you to an San Diego Padres event ticket page. ScoreBig's event ticket page will display all available San Diego Padres tickets for that event. On the event ticket page to help with your search for the right San Diego Padres tickets, use the filters at the top to select quantity, price range, and more. There is also an interactive seating chart so you can pick where you want to sit. When you are ready to buy a ticket, click on the listing, and you will be directed to ScoreBig's checkout page. Upon completion of the information fields, your order will be processed and your San Diego Padres tickets will be delivered via email, mail, or to your mobile device. What makes ScoreBig’s site stand out from the rest? We are constantly analyzing our competitors to improve our site, service, and prices. ScoreBig.com employees strive to offer the best process and experience to buy cheap San Diego Padres tickets. Our goal is to get you the best seats to San Diego Padres events. We offer daily discounts on our site and for special promotions check out our newsletter. If there are no San Diego Padres events currently available, you can use our search feature at the top of the page to see a list of all popular events going on near you. No matter your price point, we have all the best deals and discounts on San Diego Padres tickets. For more information on prices of San Diego Padres tickets and the schedule for San Diego Padres, check out our listings above. The last thing you want to find out is when the San Diego Padres event you wanted to go to is sold-out. Don’t worry in many cases ScoreBig has affordable tickets to sold out events. We sell tickets from GA all the way to premium seating and parking. Skip the scalpers in the parking lot and get your tickets online from top San Diego Padres ticket brokers. We get you in all events, buy your San Diego Padres tickets here from a brand that many trust and rely on for all their ticketing needs. ScoreBig offers a 100% money-back guarantee. If you have been in search of cheap tickets for San Diego Padres, ScoreBig by far is the best option. That’s why ScoreBig has more loyal customers than any other ticketing site. 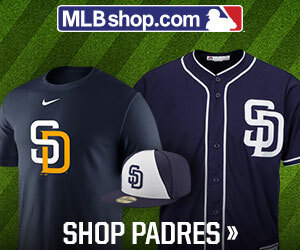 Shop at ScoreBig for safe and secure San Diego Padres event tickets.